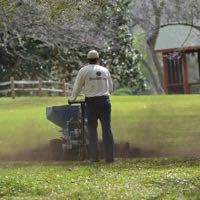 Dillo Dirt™ is a topdressing fertilizer made by the City of Austin since 1989 and is a quality soil mixture made from recycled materials. We’ll bring it straight to your house. Not only will we bring the Dillo Dirt to your house, but we’ll spread it for you. 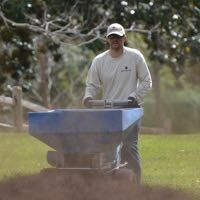 Our specialized equipment allows us to quickly create an even layer of Dillo Dirt across your lawn. One of the most beneficial things you can do for your lawn is “core aeration”. It relieves soil compaction by removing plugs of soil ¾ inch wide & 2 ½ to 3 inches long. The removal of these plugs is a form of cultivation that allows more oxygen, nutrients, and water to reach root systems. 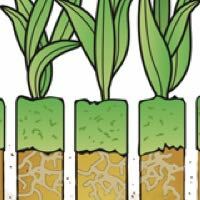 Aeration loosens the soil, making it easier for root systems to develop and stay healthy. My lawn was in fairly bad shape when I called DilloDirt.com. They treated my lawn and it looks better than ever. They worked quickly and I couldn’t be happier with the results. We love DilloDirt.com. The most honest and dependable company I have worked with. They showed up on time and I love the fact they didn’t collect any money until the work was done. I would recomend them to anyone out there. My yard looks great. Thanks guys! I called the guys at DilloDirt.com to help me out. They came and treated the yard and the results are amazing! I couldn’t be happier with their quality of work and professionalism. DilloDirt.com © 2017. All Rights Reserved.